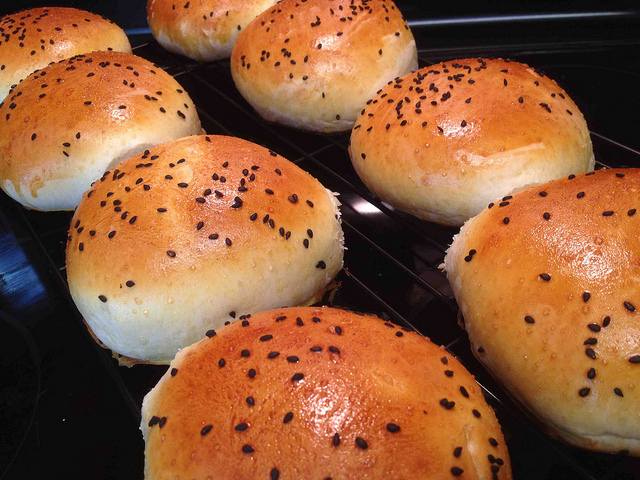 Fresh golden brown burger buns with sesame seeds. Smack yourself up a big good home burger for these puppies cause' they good. Sprinkle the yeast into the water and leave for 5 to 10 minutes, until frothy. Stir to dissolve. In a big bowl, combine all the ingredients and mix well. Turn the dough out on to a lightly floured working surface and knead for about 10 minutes until you've made a soft, smooth dough. Place the dough in a clean and lightly greased bowl. Cover it with a towel and let rise for about 1 (or1-1/2) hour, until doubled in size. Divide the dough into 8 pieces and shape each piece into a flattened ball. Place the buns on greased baking sheets, cover with a towel and let rise 30 to 40 minutes, until they're quite puffy and doubled in size. Glaze the buns with the egg yolk and water mixture, then sprinkle with sesame seeds. Bake the buns for 12 to 15 minutes, until they are golden brown. Remove them from the oven and cool them on a wire rack.